Curious as to how we determine the dates on many of our pieces? We are fortunate enough to have obtained a handful of old catalogs and internal documents pertaining to the hallmarksused by the Georg Jensen Silversmithy. The different hallmarks have been used during different period of time, and combined with our knowledge of silver content and the years of which the designers were active all combines to help us determine the age of an item. Some of the documents we have included to the side and below. Other hallmarks can also include Swedish year markings and The Designer Initials which can further assist in dating a particular item. A quick list of some of the possible Georg Jensen hallmarks. A more detailed listing below. Click the image to enlarge. 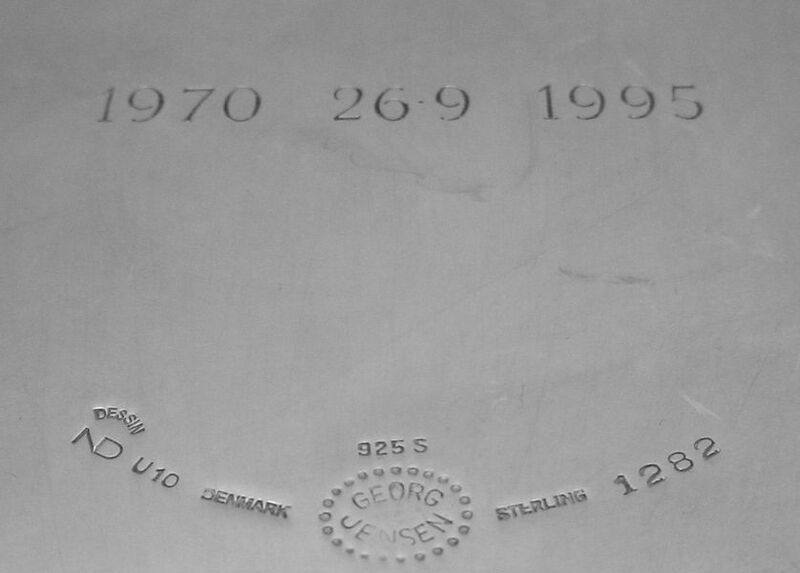 A more detailed list of the various possible Georg Jensen hallmarks and when they were used. Note the striking similarity between the 1915-1930 mark and the 1945 on mark. Most pieces bearing this mark are of a later date, however, in some cases other marks, including the silver content, and information on when a piece may have been designed or discontinued can clarify dating. Silver content markings. A few pieces, most notably during the switch to sterling as standard, may have other silver content percentages. Click on the image to enlarge. Various hallmarks related to the country of origin (Denmark) of the piece. This is another way to estimate the date of the item in question. Here are some older examples of the hallmarks in use. Scroll further down to see various examples of the more interesting hallmarks we have had in our possession. Example of one of the earlier GJ hallmarks. Although this marking might indicate a 1904-1908 date, the fact that it is marked sterling dates it later. This is still a Jensen piece however, as this marking was also used later for other, smaller pieces till 1945. Another example of the hallmark pictured above. Again, this piece is after 1945, however the mark is used on a small brooch. You can also see in this photograph that the mark was punch on to the piece after the back was soldered on, leaving a deep impression. This is an example of the Classic GI marking inside a circle of beads (used from 1915-1930), as well as the .830 mark used before 1927, denoting the 83% silver content used before going to the sterling standard. Also present is the GI 830S mark as well. Often earlier pieces could be stamped multiple times. This set of marks combines the circle GI mark with Georg Jensen mark from 1915-1930. a similar looking mark is used today. Because it's stamped sterling, it's most likely made after going to the sterling silver standard, dating the piece between 1927 and 1930. This old mark has the simple GI inscription as well the the 830 mark and "DENMARK". This set of hallmarks combines the 830 silver mark with the GI and, unusally enough, the city "COPENHAGEN" The circled GI marking places it between 1915 and 1930. In this case the .830 silver mark would date it pre-1927, and the city mark was used between 1907-1915. The current Georg Jensen hallmark bears an uncanny resemblance to one of the older hallmarks. One way of differentiating the two is the 830S mark. Continental silver, which only contains 83% silver, was the older standard used before 1927, when the silversmithy switched over to Sterling. Here are two stunning examples of the 1933-44 hallmark. This set of hallmarks was from 1945-51, and was used only in the Copenhagen Georg Jensen shop. Here's an example of yet another unusal hallmark. You can clearly see the "Georg Jensen" hallmark with the crown which was used between 1925 and 1932. Also present is the GI .925 mark and the designers initials (In this case, Harald Nielsen). This mark was also used on some of the smaller pieces in later years and bears a striking resemblance to the more current hallmarks used. Because of this, knowing the time period of the design and its production period is essential to dating the pieces. Different hallmarks were often used on different pieces due to space limitations. 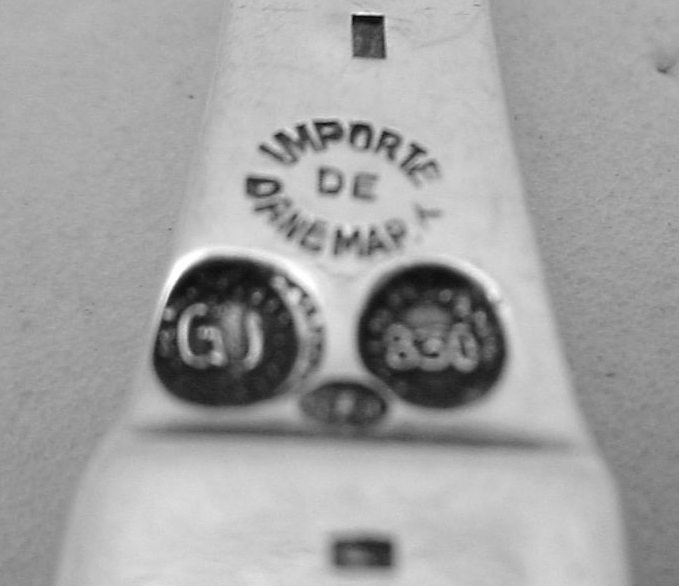 The second 2 in the model number is slightly cut off, and although the regular Georg Jensen hallmark is present on this example of a post 1945 piece, the GI mark is more common on tiny pieces. Here's a small iron pin with the aforementioned GI initials. Other marks sometimes appear along side the maker's hallmarks. Often times these are simply duty and import stamps. A fantastic example of the variation you might find in hallmarks. Typically the stamps are done by hand on these pieces. These two sets of hallmarks are from identical bracelets, however the alignment and placement of the hallmarks is quite different. Also of note are some of the older clasps, as shown on the left. The clasps have varied throughout the years with their designs each with their own aesthetic and functional aspects. The one pictured is unique in how much attention to detail has been given. Notice that the hinge connection is actually formed in brass, not sterling silver. The rationale behind this is that as this particular section of the clasp is most prone to force and damage, the brass is actually better equipped to handle the stresses and the possibility of being deformed than the softer sterling silver alloy. The whole of this clasp formed by hand, and the attention to detail can be seen in the well fitted sliding holding pin, as well as the elegant cut out curves on the structure holding the clasp. The holding pin itself is tube like in it's design, showing consideration for the wearer in its design, as it covers the sharp tip, preventing the wearer from accidentally being poked. In contrast to one of the clasps above, which uses a simple eye hook, there are many things that make these older clasps unique, and this is yet another way that hints at the ages of our items. Below are examples of when year marks were used from time to time to mark specifically the year of manufactury of a particular piece.. This is an excellent example of the three towers mark, denoting the year of its manufactury (1926) Also present is the GI 830S mark. The CFH stamp is actually a guardian stamp and was used between 1904 and 1932. This unusual brooch actually uses the Georg Jensen hallmark to form part of the decoration of the nose of the lion. We're unsure if this is intentional or another example of a mistake in the stamping process, but it is, nevertheless, very unusual. Here is the reverse of the same lion brooch where you can see the actual hallmark in its proper location. This is an example of the 1925-32 hallmark, which, in this case, was probably used on a later piece, as was typical of some smaller jewelry pieces.